Monument dedicated to all animals who have served our nation in times of war and peace. The memorial also contains a R.A.A.F Dog Handlers Association Plaque. The memorial plaques were unveiled in the Caloundra RSL memorial garden, on Sat 28 November 2015 by the Australian War Animal Memorial Organisation, (AWAMO). VIP`s present included several RSL Presidents and guest speaker Bob Atkinson-ex Qld Police Commissioner. Attending the dedication and representing war animals were Pilot the clydesdale horse; light horses from 5th Light Horse Regiment in Maleny; Stan the Ram, the mascot from 8/9th RAR Battalion; RAAF working dogs; Queensland Police Service dogs and some pigeons that were released at the conclusion of the dedication. The memorial recognises the sacrifices and deeds that animals have undertaken in battlefields around the world. 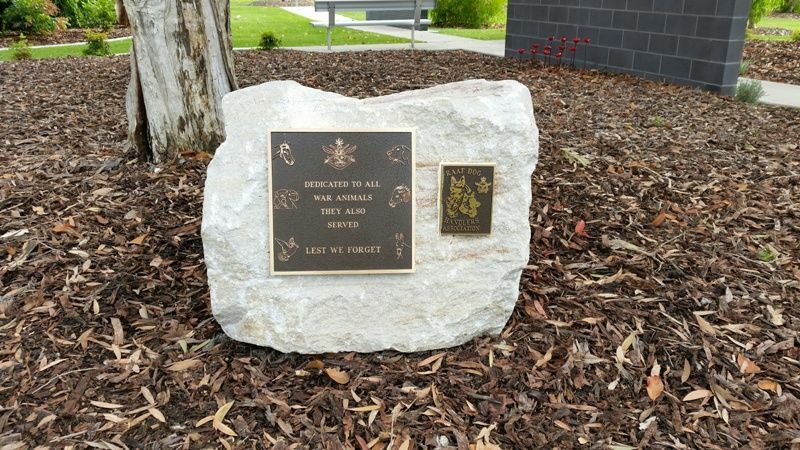 Senior Constable Nigel Allsopp, a current-serving police-dog handler and President of the Australian War Animal Memorial Organisation, was a driving force behind the war-animal memorial dedication.